This week on Spellburn we take a look at how to create a supernatural Patron! 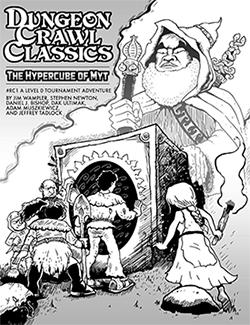 Patrons are one of the coolest and most unique aspects of Dungeon Crawl Classics RPG. Every Judge will have a reason to make one as a foil, as a PC ally, and of course just for the fun of it! We’ll talk about how to generate them, how to fine-tune them and what distinguishes them from other fickle entities like the GAWDS. All this and more on this week’s episode of SPELLBURN! Don’t miss the latest Dungeon Denizen contest with art by Stefan Poag! Follow this link, enjoy the image, and send your entry to theband@spellburn.com by Mid-November! The caster forms a bond between his patron and the subject, who is indispensable to the patron. The patron bestows a major boon on the caster in the form of a permanent +1 bonus on all castings of invoke patron and patron spells, and grants a major boon to the subject in the form of a +1 bonus once per day to an action performed in the service of the patron. The subject receives a prominent mark of the patron on his hand or face, and may attempt a Luck check once per month, at a +4 bonus, to ask a major favor from the patron, which may manifest in a magical manner. Each time such a Luck check is attempted there is a 2% cumulative chance that the patron asks for something in return. In addition, the patron sends followers to aid the subject’s natural actions. The followers consist of 1d4+1 warriors, each of level 1d3. All bear the mark of the patron. They [sic] warriors serve with absolute loyalty (no morale checks are ever required) and ask for nothing in return save adherence to the principles of the patron. The caster is viewed favorably for bringing more followers to his patron; for every 10 followers recruited and bonded, he receives a +1 bonus to future patron bond and invoke patron checks (max +5 bonus). I am glad to donate a PDF copy of Death Slaves of Eternity or Steel and Fury to the winner (sorry I can’t offer as many choices as Daniel). Please let me know what you think? Why the heck not! Sounds great Marzio, thanks! Very kind of you, Marzio. Considering your exalted DCC status, your ongoing contributions to the podcast and your middle initial, we might have to appoint you an honorary Judge J, Mr. Bishop! But you’d have to share your middle name with us and the listeners. The J stands for Joseph. Wow, that’s good company in these parts. Pretty sure the J stands for “Just finished writing another DCC adventure”. Daniel’s output is nothing short of amazing. That’s worth calling out on a future episode! We’ll credit you, Marzio. I don’t view it so much as a “you shall become me” thing as a corruption type thing. That is, when you cast spells, you open yourself up to the flow of phlogiston, which is chaotic and causes changes by its very nature. It is flux. You risk being changed by it by coming into contact with it. With Patrons, you are not just opening to this flow of energy, but a certain flavor of energy… the nature of that energy causing changes of a more specific kind… in tune with the nature of the Patron. Some Patrons might even affect people to the extent that they become like cells of the Patron’s body… extensions of the Patron. Those Patrons being inherently parasitic in nature. A Patron of pure ego might actually make those who invoke him or her like him or herself until the invoker becomes an avatar with no real will of his or her own. I see it, in general, like people being around someone with a very strong personality being affected by that personality. Some want to imitate. Some want to oppose. Whatever the reaction, it’s going to be strong. You can’t interact with a Patron without being somehow changed by the Patron. I like very much Jen’s idea of a Patron giving the invoker something to remember… it can even be the case that whether or not the Patron has that intention, merely by coming into contact with the force of the Patron, the invoker is changed in some way by it. The change would have very much to do with the nature of the Patron, the nature of the invoker, and the nature of their relationship. The games should feel like this. This is how we get to Elric!